Next time you're in Charing Cross, pop down the rabbit-hole-like Cecil Court and you'll find a new wonderland of Alice-themed goodies. As well as other treasures, the new shop sells reproductions of an extraordinary John Tenniel-painted chessboard. Artist John Tenniel (who sported an amazing tache) was hugely famous for his illustrations in the late 1800s; as well as the pictures in Lewis Carroll's Alice stories, he also drew for Punch magazine and created the children's card game Happy Families. Rare book dealer Jake Fior bought the chessboard last summer and only later realised he'd found a unique treasure, hand-painted by the man himself. Now for £3,500, you can own one of the 150 replicas of this character-covered chess board, created by highly skilled artisans: hand-cut individual pieces of marquetry by Jonathan Walker; silk-screen printing by Jealous Print; 16.5 carat gold leaf gilding by Victorian framing expert Ken Brookes; and meticulous copies of Tenniel’s illustrations by watercolour artist Kate Hepburn. 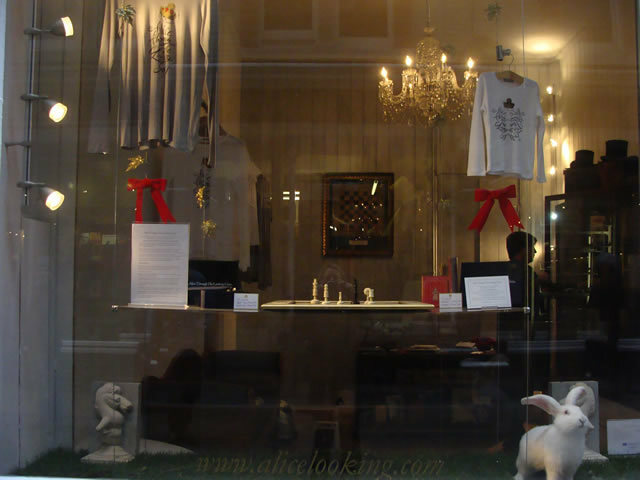 If your budget's a little more modest, you can pick up other Alice-themed goodies, from the Alice Looking fashion range, vintage Victorian top hats, original Fillmore Jefferson Airplane posters, to Bobby Fischer chess books, Op Art originals, and limited edition prints. There'll also be special events in store throughout the year, including a Blitz Chess competition, and a screening of the 1966 classic, Alice in Wonderland by Jonathan Miller. 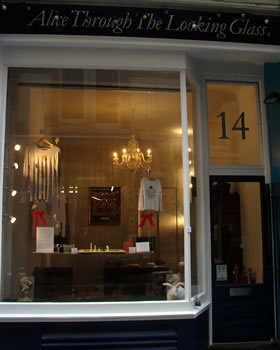 Alice Through The Looking Glass can be found at 14 Cecil Court, London, WC2N 4HE. Visit alicelooking.com to find out more. Hat tip to Peter Watts for the story.